Do you wish to learn more - come paint with us - contact Donna Phillips, VP Membership at phillipsrondon@verizon.net. Info on classes and paints-ins contact Marilyn Tracy mtracy4104@comcast.net or Fran Schmitt at rschmitty@verizon.net. MAY 11, 2019 - PVDA Business Meeting & 3-4 Hour Class with Marilyn Tracy - Butterfly in White from the Summer 2017 Decorative Painter. 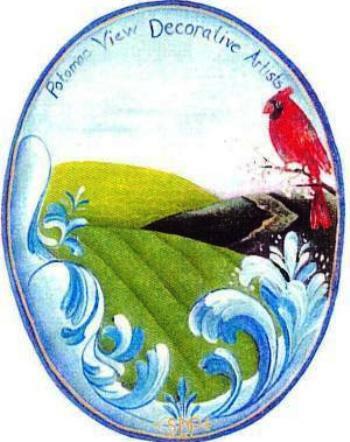 According to the National Society of Tole and Decorative Painting now known as the Society of Decorative Painters (SDP)(www.decorativepainters.org) decorative painting is an art form that uses a variety of techniques to decorate functional and non-functional surfaces. The use of patterns and freehand designs give a high degree of success without formal training or any inherent drawing ability. With creativity, and practice, decorative painting enables artistic self-expression and creative satisfaction. You are welcome to drop by any PVDA Chapter meeting and check us out. See PVDA's calendar of events page. Click PVDA Commitee News Section (titles on the side-bar) and then click on the Paint-In and Meeting Project Information link for more information. For Seminar Information, CLICK ON: PVDA Committee News Section (titles on side-bar)- then click on Seminar Committee News. Beginners are encouraged to join in and we guarantee you will learn a lot, have a good time painting and will enjoy the fellowship of new painting friends. Classes are taught in a "paint along" style. Instructors will guide you step by step as you create the featured project and before you know it, you will have created your own piece of art. Absolutely no experience is necessary to have a great time. Non-membes are encouraged to attend our events - you may try us out twice before you join the painting chapter. Whether you are an experienced artists or just discovering your hiddent talents, PVDA will provide opportunities to learn and paint, as well as develop new friendships. PVDA'S 2019 Annual Raffle Item is a large wall-shelf with interchangeable oval plaques which will be painted with seasonal flower designs.i.e Daisies for summer, Poinsettia for Holiday/Winter - Sunflower for the fall. Pictures soon. PVDA'S 2019 SEMINAR WILL BE ON MAY 4 & 5, 2019 WITH BOBBIE CAMPBLEL.